It will be sad and a major setback if 5000 jobs are not realised and 300 million pounds in investment lost. 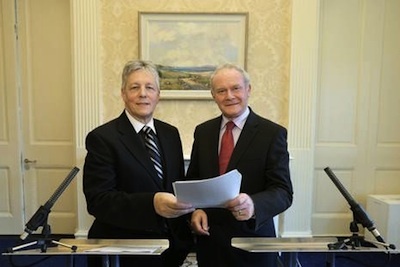 More important than Peter Robinson reneging on the MLK [Maze/Long Kesh] project, is what his decision symbolises. Yes, it is far bigger than jobs and investment: it is whether there exists a workable political process in the North of Ireland. For whatever reason, democratically elected unionist parties have allowed their authority to be relegated to and their direction dictated by those who do not really believe in parity of esteem and equality. There are others who feel left out: but this is hardly the fault of Sinn Fein, but is a failure by unionist leaders. It was Billy Hutchinson whom I first heard use the slogan that there is a “war on unionist culture”. This mantra was immediately taken up by mainstream unionists, perhaps because they felt it provided them with an excuse for stalling political progress, when, in truth, it revealed their lack of leadership and the fact that they hadn’t explained the reality and cost of compromise with Sinn Fein. But this is an invented and imaginary conflict for which the gullible will fall and for which innocents might well die. Let’s examine how Sinn Fein wages this war: it supported the amendment of Articles 2 & 3 of the Irish constitution (articles described by unionists as “the raison d’etre of the IRA”); it ended its 70-year-old policy of abstentionism and agreed to take its seats in Stormont which symbolised 70-years of nationalist oppression; the IRA decommissions its weapons and calls upon former activists to work politically for a united Ireland; Sinn Fein recognises and supports the police; Martin McGuinness meets and greets the British Queen; the Union flag continues to fly from Belfast City Hall on designated days; Sinn Fein raises no objections to the Orange Order parading past Ardoyne on the morning of the 12th July. On the other hand, we have seen unionists attempt to goad republicans that their decision to compromise means they recognise that the North is British, that they have to repudiate their struggle, inform about past IRA actions and name those involved, that former IRA prisoners cannot serve as ministerial advisors, and that republicans cannot commemorate their dead, including the sixty who lost their lives in Tyrone. Peter Robinson used the Castlederg commemoration as the excuse to sink - hopefully, just - the MLK project, 5,000 jobs and the investment. There hasn’t been a republican parade in Castlederg (which is 60% nationalist) in almost twenty years. But in those same twenty years there have been almost 400 Orange parades in the town, including an Apprentice Boys parade through the town centre on the eve of the republican commemoration. Yes, that’s some war on unionist culture. I don’t think I have felt as despondent since the night the IRA broke its ceasefire with the explosion at Canary Wharf, blaming John Major for dragging his feet and frustrating progress. For acting as if republicans could be rolled over, as if he could win politically what he hadn’t won militarily. Not that for a moment I think that political stalemate will trigger a resumption of armed struggle. Too many of us are relieved that those days are over and done with and are pledged to politics alone. I hope I am wrong but I suspect that the Assembly could collapse. If unionists are thinking this cannot happen, they should think again.